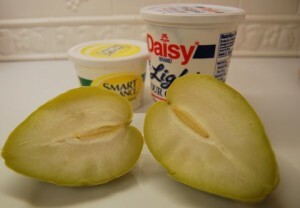 I recently read about this quick and easy substitute for a baked potato – the chayote fruit. Fat to Skinny author Doug Varrieur suggests using it like a baked potato and adding sour cream and butter! I’ve done this a couple times and love it! Shrinking Man does not like it at all. You be the judge. In me it satisfied the sour cream and butter combo I have always loved and since the chayote doesn’t have much of a flavor, you primarily taste the toppings!